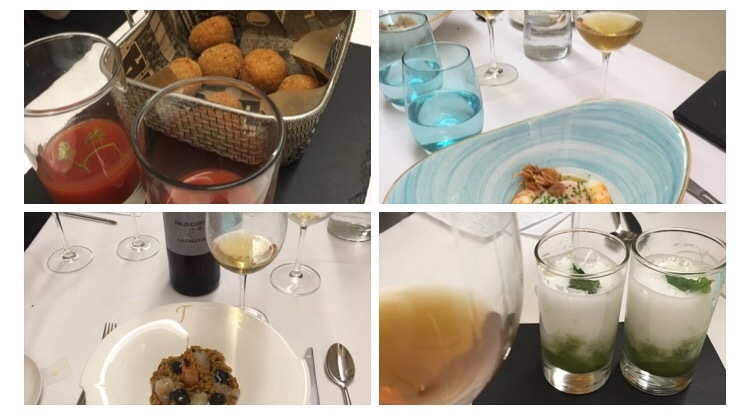 Day 2 of Ramiro Ibañez´s masterclass on wines of the marco and while Day 1 was – with the exception of one very fine manzanilla – all about tuna and the meaty, muscular flavours of the rest of the region, in Day 2 there was a clear emphasis on the langostinos and all things Sanlucar. The solid matter was again absolutely top class. We kicked off with some croquetas (langostino, obvs) and Surtopia’s signature bloody sherry, then a carpaccio of langostino with a foam of manzanilla, a ceviche (of guess what), an absolutely brilliant dish of langostinos and poached egg (give me an egg and call me an idiot, as they say around here), a tasty, tender false rice with, ahem, langostinos and finally some refreshing rebujito ice cream shots. No complaints whatever: on another day this post would be about the food. But today was about the wines, and what wines they were. Wine #1 was none other than UBE 2014, by Ramiro himself at Cota 45. This is an unfortified, 100% palomino (from three strains) from Pago Miraflores, fermented at atmospheric temperature before ageing 14 months in bota (but not under flor). Interestingly, Ramiro reckons this to be both the simplest wine to describe and the hardest to understand, and you can see where he is coming from because for a straight up palomino this has a few unexpected dimensions. Beautiful bright, gold colour with some goldish green hues. On the nose first up it was pure blanc des blancs – strawberry pastry aromas. On the palate the first sensation is the dissolved chalk sizzle of the minerals – really buzzy -and then a big dose of tasty, viney fruit but then what Ramiro calls the “verticality” takes over – long, direct and mineral. Lovely fresh finish. It maybe difficult to understand but it is a doddle to drink. Cracking start. Wine #2 was an absolute beauty: Maruja Manzanilla Pasada “Bota No” 1/3 – from one of three botas kept to one side in the Maruja solera and only refreshed as necessary to replace the merma. 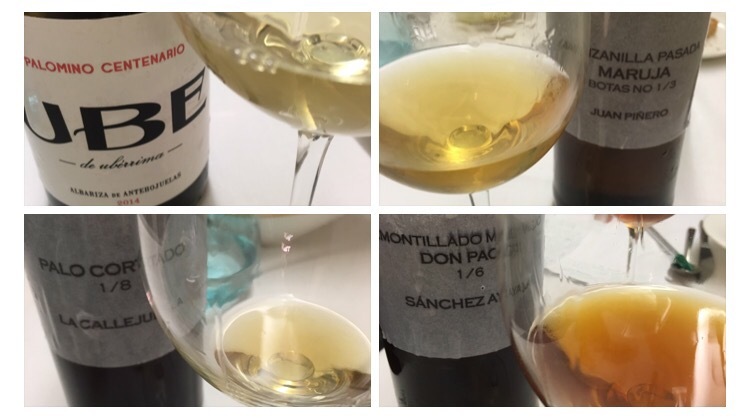 The result is a wine that has slightly more golden, less orange colour than the Maruja Manzanilla Pasada and a more refined but somewhat less fruitful profile. There is a lot of acetaldehide, herbs in the nose and on the palate and a rich, salty butter texture that indicates a long exposure to the cabezuelas (something more common in finos than manzanillas). One step beyond in manzanilla pasada terms. Wine #3 was another rarely (never) seen wine, a Palo Cortado la Callejuela 1/8. A rare example of a Sanlucar palo cortado (at least I can’t think of many) but there is no doubt about the classification. A nice brown-gold in colour and a lovely sweet nose with those toasted, burnt butter aromas. On the palate it is salty, spicey and slightly bitter, with liquorice and even coffee flavours. Not the most intense, acidic or explosive of palo cortados but elegant and enjoyable. Wine #4 was the star of the show for me, the Amontillado Muy Viejo Don Paco 1/6 from Sanchez Ayala. A single pago wine – fruit sourced from Pago Balbaina (Viña las Cañas) it would have spent some several years under flor and is a total of around 50 to 60 years old. A tone darker and redder than the preceding wine it had a salty, fine nose with just a bit of sweet nutmeg to it – a spicier sweetness rather than a pastry one. On the palate the intensity of sapidity and salinity is remarkable – a real all enveloping zingy power to it that gives it an explosive start and a big impact up front, with toasted nut and spiey nutmeg flavours that just balance the salinity. From there it is long lasting but without dragging its feet – not astringent or harsh. As luck would have it there was also a bonus glass that was even better. Last but not least, wine #5 was another vino de la casa: the 11540 Medium Sweet. Again sourced from Sanchez Ayala this is a fascinating little wine made up of 60% amontillado, 20% youngish PX, and, innovatively,20% manzanilla Gabriela Oro that spent a short time in bota together before bottling and hang together really nicely. It is an attractive dark-straw gold in colour and whereas I find that some medium wines can come across as spirity and over sweet on the nose – but this, while ripe-tomato sweet has a nice balance with a little bit of herbs and sea breeze. That little bit of manzanilla also gives it a bit more balance on the palate at front and back – a little bit of bite going in and a freshness to the palate. Ramiro described it as more “vertical” than many mediums and I would buy that. Interesting, imaginative stuff. And that was that: five more unique wines in a variety of styles and a fascinating contrast with the first day. All in all a really fantastic event and a great chance to fire some questions at the maestro himself. There will be more to come from my notes when I get a chance to write them up.